Last year, Finance Magnates covered the launch of a bitcoin prediction page launched by digital wealth management firm, Hedgeable. The product let users enter their predictions for the price of bitcoin with users also selecting whether they were a trader, VC/angel investor, media person, entrepreneur or bitcoin enthusiast. The price estimator was created as Hedgeable also announced that it was adding bitcoin to its list of alternative investments that customers could add to their portfolios. According to Hedgeable, the addition of bitcoin made sense as it provided portfolio diversification and offered exposure to the advancing blockchain technology sector. 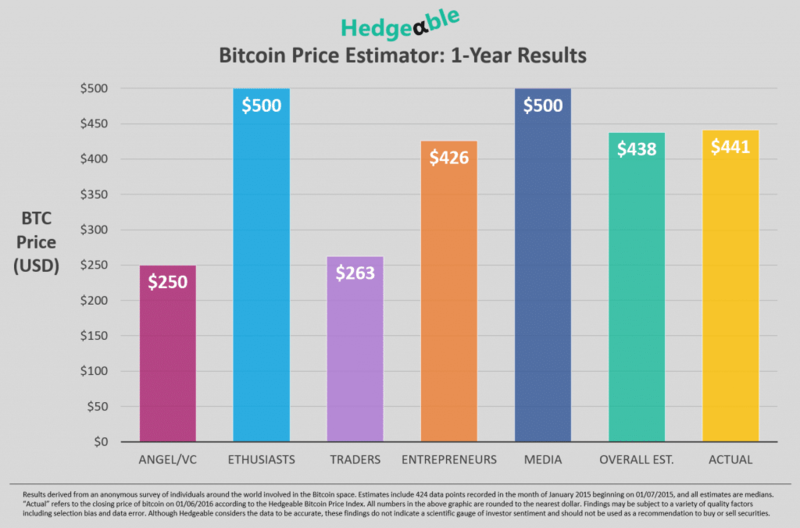 Now in their second year of including bitcoin in portfolios, Hedgable has published an update on the first year experience. According to the firm, the company was derided by other wealth managers, with bitcoin viewed as too risky for investors. With year one complete, the experiment so far has been a success for Hedgeable due to the strong interest in blockchain technology in 2015 and the subsequent price appreciation of bitcoins. Publishing stats this week, Hedgeable reported that the average purchase of bitcoins was $281 and composed 1.6% of account holder portfolios. Thanks to a 60% return in bitcoin prices, despite the small allocation, the digital currency still accounted for a 0.96% performance impact to investors. The price estimator also turned out to be very close to the actual results. As seen below, forecasters in January 2015 that provided a one-year estimate had predominately expected higher prices for bitcoins. After trading between $200 to $250 in January 2015, prices are currently trading around $430. Overall, the median forecast was $438, which compares very well with prices so far in 2016. People looking for a theory to understand the value of currency may be interested in solarcoin.